You can create and move it like a standard targetcamera or use a convert macro if you prefer the old technique. This has been improved fundamentally. A Full-HD frame optimized anaglyph takes less then a second, making it much more attractive to render anaglyph previews. The stereocam can now be aligned to left, center or right side, so you only need to rerender one camera if you made adjustments. It is also very useful if you want to convert old short films to 3D with less rendertime. Choose from and create new pixel parallax presets to get the 3D just right. The stereocam can be switched to VRay with the click of a button and offers you the choice of using two physical cameras or the stereoscopic helpers. Render your images wider without affecting the field of view and have the ultimate control over your depth in the post. Send jobs to the network just like any other camera. Watch your viewport in 3D while working. All changes will be immediately reflected in the stereoscopic window. Choose from red/cyan, magenta/green, or amber/blue with monochrome, half-color or optimized algorithm. Utilize the power of the stereoscopic player from 3dtv.org .View and adjust either your interactive viewport preview or the rendered results from within the Stereoscopic player offering you even MORE compositing types (e.g. quad-buffered opengl, 3dvision, iz3d). 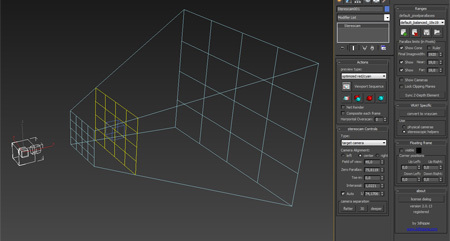 Adjust the zero parallax even after you rendered! Just shift the images until the desired depth placement is reached, hit „sync“ and the rig will accomodate to your changes. Make an animated viewport sequence in full-HD. You can generate a 3D-Clip or use the stereoscopic player connection. The PRO license is worth 249€. To order a PRO license download and install the FREE version first. You will need your authorisation code to complete the purchase. Read more about licensing in the accompanying readme file. To get the most benefit from 3dhippie stereocam I highly recommend to purchase a license of the stereoscopic player as well. Der Beitrag wurde am Dienstag, den 4. Dezember 2012 um 16:59 Uhr veröffentlicht und wurde unter main abgelegt. Du kannst die Kommentare zu diesen Eintrag durch den RSS 2.0 Feed verfolgen. Kommentare sind derzeit geschlossen, aber Du kannst dennoch einen Trackback auf deiner Seite einrichten. I’m interested in using stereoscopic 3dsmax with real life footage from a stereo camera rig. How can I match the footage in 3Dsmax to the real life footage? are there settings I can make, like for instance interaxial distance, lens settings? I want to compose both CGI and real life footage in After Effects. (or if must be in 3Dsmax). Hi Hans. Of couse you have settings like interaxial distance and lens settings. But I’m not very familiar with matching real life footage. In theory it should be absolutely possible, but the footage must be really good and stable. I think some tracking software (e.g. Syntheyes) can track stereo-footage an generate 2 cameras. This might be more interesting for you. congrats! nice tool. But where i can find my rendered images? is there an output path dialog? can i render out finished composed sequences? Hi Sebastian. The script uses the renderoutput path specified in the default render dialog. If you check, composite each image, it will create a finished composed sequence. I am interested in purchasing your plugin, but can you confirm if this works with active 3D? I have shutter glasses so I assume i would have to run everything test wise through the stereoscopic player. I have checked out the layout options after downloading the trial of the stereoscopic player and there is a lot, interlaced, side by side, 2d and depth etc, what is the default output from your plugin to run in this player? Apologies if I have missed this information on your site. Hi Alex. You assume right, to use shutter glasses you will have to use the stereoscopic player. The 3dhippie stereocam will save a temporary left/right stacked image and open it in the stereoplayer. The correct option is probably 3dvision, but you can change the displaymode at any time. Just load any 3d picture or movie in the stereoplayer (there are some in the download section of the 3dtv site) and try to find the correct displaymode. If you’re able to view the film properly, the 3dhippie stereocam will be perfect for you. I have downloaded your trial and selected ‘viewport sequence’ and checked open with stereoscopic player, but even with Nvidia 3D vision selected in settings for my asus 3d screen, the video play top and bottom and has no 3d effect. Are you sure you have the most recent version of the stereoscopic player? It must be at least 1.9.3 . Yes, i purchased a license for the latest version today. If you have any suggestions this would help greatly, once I can confirm a success I will be happy to purchase. Hi Alex. Have you successfully opened any file with the stereoscopic player and been able to watch it in a good viewing mode? My next test consisted of a quick render with leaves in 3d max as particles falling past the camera but this does not seem to render left and right eye images, a normal camera however does seem to render them fine. that’s good news. I have not come across that problem and can’t think of any reason. Maybe you have chosen a really high interaxial and the cameras simply miss the leaves? Or you have checked “link clipping planes”, and the leaves are being clipped away? Hi Kevin. The camera is currently only interacting with the stereoscopic player. But I will look into making a connection to stereo photo maker. Shouldn’t be too difficult. Thanks for the idea.